This is the forehead that defeated countless enemies and charmed numerous women. But also ended up getting smacked down a lot. —They Might Be Giants, "We Want a Rock"
The tendency for all sci-fi alien species to be one facial feature away from humanity. Sometimes they're not even that far away. They look totally human and sound human. In some cases, this may well be a disguise, but in others this appears to be their natural appearance. See Human Aliens. You'd think that alien species would be radically different—insectoids, three-legged wombats, giant cats, etc. -- but the effects budget only allows for latex and makeup, so we get humans with brow ridges, humans with extra nostrils, humans with Pointy Ears, humans with bony protrusions, and so on. Gene Roddenberry gave more reasons for this in an interview once. Budget constraints aside, if you try to make aliens look completely alien, you'll firstly make them look ridiculous (cf. Doctor Who), and secondly make it doubly hard for the actor playing the alien to do anything mildly resembling acting. This has actually been isolated to extremely specific requirements: if an audience can't see an actor's eyes or mouth, their ability to empathize with or emotionally invest in that character is significantly impaired. This is one reason why Mooks, especially SF mooks like the Cylons or the Imperial Stormtroopers, are so often uniformed in face-obscuring helmets. The Anime equivalent is the alien with Pointy Ears, colorful facial markings, or cutesy animal-like traits. Rubber foreheads also tend to be paired up with Humans Are White for some reason, likely the fact that back in the 60s/70s it was easier to get a black, Latino, or Asian actor on TV by gluing something to their heads and claiming that were raceless otherworldly beings instead. The next step past Rubber Forehead Aliens (catlike or buglike or lizardlike aliens that can still sit in chairs and hold weapons) is Humanoid Aliens, possibly overlapping with Intelligent Gerbils. Contrast with Starfish Aliens. No real life examples, please; at least, not until we actually meet aliens. In UK advertising, the Tefal Eggheads. Later parodied by Ant McPartlain's actual forehead. In Crest of the Stars, the Abh were distinguished by their blue hair though some of them also had pointy ears. This one does get justified, though, in that the Abh are in fact genetically altered humans, who even call their stellar nation the "Humankind Empire Abh" (or a variant, depending on how you translate it); the Abh see themselves as basically humans with a few different traits, while their (non-modded) enemies tend to see them as vile aliens, wholly different from humanity. One of the narrative thrusts of the work is examining just how human they really are - or aren't. In Outlaw Star, the Ctarl Ctarl are essentially Cat Girls from space. Mahou Sensei Negima does this with many inhabitants of the magic world; they look like normal people, but with horns or weird shaped ears or something. The rest are Petting Zoo People. The Saiyans in Dragonball Z are pretty much just humans with tails in appearance; that turn into giant monkeys during a full moon. They also have fur instead of hair, which is why it doesn't need to be cut. Practically all aliens in Leijiverse. Mazone, Illumidas, Tokarga... they're all basically humans with slightly different skin colour, even the Mazone who are plants. Miime's race is unrevealed, but she's also fully humanoid apart from not having visible mouth in most? story versions. Elves in Elf Quest are basically humans with pointy ears and four fingers. This is because their shapeshifting alien ancestors deliberately took on a human-resembling form before landing (they even reshaped their spaceship to look like a palace). But even before that (flashbacks), said ancestors already looked fairly human in shape, and would have qualified as Humanoid Aliens at least. Lampshaded in some Space Agent Valerian book. There are quite a few non-human aliens but also a multitude of practically humans, to the point where it's mentioned that "one head, two hands, two feet, two eyes, could be anyone". The movie This Island Earth's aliens were similar to humans except for huge foreheads and white hair. The actors literally wore rubber foreheads. ...but I'm not an alien! In Galaxy Quest, the character of Dr. Lazarus from the Show Within a Show is played by Alexander Dane (who is in turn played by Alan Rickman) wearing a rubber forehead. The Thermians, of course, think he is a real alien, even though his rubber forehead begins to show damage and develop holes over the course of the adventure. The Thermians themselves are a subversion of this: on first appearance, they look like short-ish humans who have Vulcans for hair stylists. However, it turns out it's just an illusion; they're really Starfish Aliens. The Fifth Element has a variety of particularly tacky examples. The alien opera-singer sort of looked like a hybrid between an Asari, a Twi'lek and a Xenomorph. The Battlefield Earth film featured the Psychlos, whose main distinguishing features were that they were big, had eyebrows that joined their hair, high foreheads, and dreadlocks. Star Wars has a lot of humanoid aliens, most of which find the nitrogen/oxygen atmosphere found on human-inhabited planets tolerable, if not comfortable (there are of course exceptions to this rule, such as the Kel Dor, who must wear goggles and breather masks at all times on human-habitable worlds). There are also, however, several non-humanoids, including a handful of insectoids, a lobster-like species, more than a few quadrapeds or hexapeds... and one that looks like nothing so much as a floating brain. The most human-like aliens are called near-human, and are considered to have descended from humans (the blue-skinned, red-eyed but otherwise human Chiss are a typical example). The Yuuzhan Vong basically look like big, muscle-y humans with a few deliberate errors- their skin tones are varying shades of grey rather than brown, they have talons instead of fingernails, their foreheads are prominent and sloped, and their hair is almost always black when they're not bald (which is more common among them than it is among humans). Artists also commonly depict them with pointed ears, though this is never described i the novels. Of course, since they treat ritualized Body Horror as a mark of high status, the higher-ranked a Vong is, the less humanoid they usually look. Justified Trope in Anathem: the Urnudans, Latierrans etc are humans from the universe next door. The Classic Space Opera The Lensman Series had human, humanoid and utterly alien species. Of course it also had a guiding sentient race that was controlling evolution on many different planets. Justified in one of the earliest science fiction novels, "Last and First Men". The varieties of human aliens are a result of original humanity escaping from a dying Earth. For two billion years, humanity evolves through nine different stages and splits off into a smaller set of subgroups. A large number of The Culture alien species are near human. It was explained as a convergent evolution thing. C. J. Cherryh's series Foreigner deals with the deceptively humanoid alien race known as the Atevi. While they look similar to us, they think entirely different then Humans. In Star Trek, Klingons, Vulcans, Bajorans, Ferengi, and Cardassians, just to name a few. In fact, the majority of all races encountered in every Star Trek series has two arms, two legs, a head, and a general chest area. The exceptions are usually Monster of the Week types. For example, the Bajorans. Small ridges on the nose are the only visible differences between fully-clothed Bajorans and fully clothed Humans. Of course, there is a reason for this, as noted above: the Bajoran makeup was designed the way it is specifically to make sure that the (numerous) Bajoran females who would appear in the franchise would all still be good-looking. The Bajorans were also planned from the outset to be refugees. The minimal makeup was convenient for costuming large crowds and child actors. The Star Trek: The Next Generation episode "The Chase" provides a tidy explanation (part Retcon, part Lampshade Hanging) for the prevalence of Rubber Forehead Aliens in the Star Trek universe. All the main races in the universe were created from "seeds" placed in their respective worlds' primordial oceans by an even more ancient humanoid race. 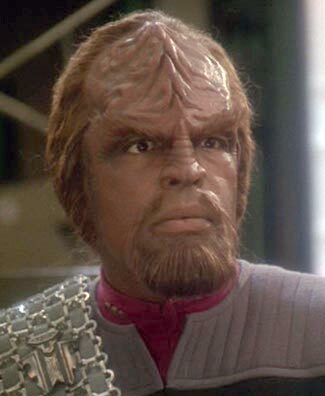 Of course, Klingons only gained their rubber foreheads when the movies' increased budget permitted it. Prior to the Retcon, they were "Entire Bottle of Bronzer and Upswept Eyebrows" Aliens. In fact, until attention was called to it in Deep Space Nine, the Literary Agent Hypothesis was the official explanation: in-universe, they weren't considered to look exactly like humans. There just wasn't the budget to portray them as they actually looked. (There's actually an onscreen reference, sort of: a Klingon posing as a human was said to have been surgically altered to appear human (if we take what's onscreen at face value, it wouldn't take surgery, just a haircut). It also makes the Romulans worse than the Klingons in the "where'd the foreheads come from?" department. They went from having ridges to to not having them to having them again to having lost them again. What the HELL? Also, keep in mind that while Klingons' gaining ridges after TOS has been referenced, and explained much later, there has never been any onscreen acknowledgment of the changes in Romulans. The Klingon's appearance in a deleted scene of the movie is actually something of a Lampshade Hanging of this issue, as the Klingon's we see have ridged... masks (as in what the characters are wearing). We don't actually see their faces. Babylon 5 had the Centauri, Narn, and Minbari, as well as quite a few (less-central) non-humanoid aliens. The Centauri are closer to being Human Aliens thanks to the only real (visible and exterior) difference being the pointed teeth, ridiculous haircuts aside. The Narn are closer to Humanoid Aliens thanks to a more clearly alien look to them, despite a similar biological configuration (curiously, the Narn are one of the few species with eyes that aren't exactly the same as human eyes). A majority of B5 aliens, however, do fit this trope. It is suggested at many points in the series that there are many less humanoid aliens both in the galaxy and on the station, but that they don't interact with the humanoid races as much. The episode "There All the Honor Lies" lampshades and inverts this trope: an official Babylon 5 gift shop is opened in the station, and they sell very high quality alien species masks but also human masks for aliens to wear! The Twilight Zone episode titled "Will the Real Martian Please Stand Up". The setting of this episode is a rural restaurant. During the 25 minute episode, we wonder which one among a group of people is the alien. It turns out, we were seeing the alien all along, and that there were two of them. One alien has an extra arm (this one is from Mars). The other one has a third eye (he's from Venus). Most "aliens" in the Stargate Verse are just humans, transported from Earth in antiquity. But of those that don't, some - particularly other species used as hosts by the Goa'uld - still fit this Trope. The Unas are just Humans with Scales, for example. And chin spikes, and only 4 fingers, which puts them more in the Humanoid Alien category. Wraith fit well enough though, once to get past their (justified) Bizarre Alien Biology. Inverted by a Wraith in the episode Vegas. He uses cosmetics to turn himself into a Rubber Forehead Human, which of course goes completely unnoticed. Super Sentai is known for being far less elaborate with theirs - Bakuryu Sentai Abaranger has the Ryujin, who merely have four tiny claws over their cheekbones. Tokusou Sentai Dekaranger in particular spammed the use of full-head rubber masks (over very mundane clothing too), unlike Power Rangers SPD which relied a lot on prosthetics. In spite of its subversions of this trope, Farscape has a few species of these floating around. Nebari look basically human except for their monotone grey skin and the fact that their hair colour depends entirely on their gender. Delvians look like hairless, blue, scaly humans. In the Cousin Skeeter TV movie "New Kids on the Planet"
Likewise, most of the demons on Charmed looked like humans decked out in heavy makeup, ear extensions and snaggle-teeth. Some of the aliens in Doctor Who fit in this category. According to The Writer's Tale, the aliens that were to become the Vinvocci were called the Prostheticons in the rough draft. In Warhammer 40,000 the Eldar straddle the line between this and Humanoid Aliens. They are thin, graceful, pointy-eared (Elf expies In Space! ), but their body structure is much more lithe and spindly. The in-universe setting book Xenology references this; while the Eldar and Tau, and to a lesser extent the Orks, look outwardly like slightly modified humans inside the races are nothing alike. The Tech-Priest doing the dissections is extremely confused by this, especially since his other subjects aren't remotely humanoid. Teenagers From Outer Space divides aliens into Near Humans, Not Very Near Humans, and Real Weirdies. The dominant race in the Jak and Daxter series are basically humans with excessively long pointy ears. Subverted in Phantasy Star with Newmans/Numans, and later Beasts in Phantasy Star Universe. Sure, they look human enough, save for their ears and (in the case of Beasts) their harelips and eyes ... but they aren't actually aliens at all. They're actually genetically engineered humans. Played straight, though: The three planets' humanoid species are Parmanian/Palmanian (humans), Motavian (furred, beaked humanoids), and Dezolisian/Dezorisian (Rubber Forehead Aliens with green skin). Mass Effect: Asari fit the trope perfectly, being blue-skinned alien space babes. Although their tentacles are actually on the back of their heads, where a human would have hair. It should be noted that, while they wear the same armor as humans in-game, every race sees them as their equivalent of blue-skinned alien space babes except possibly the Krogan, who still see them as attractive. In Mass Effect 3, if a male Shepard romanced Tali and saved the quarian fleet, Tali will leave a photo of herself without mask or helmet on his nightstand. It turns out that were it not for the skin markings, the three-fingered hands, and the avian legs, she could pass for human. On the technical side, the developers of Mass Effect admit that their alien designs were limited to bipeds with human proportions because of the Unreal engine's combat system. In fact, even the tridactyl, digitigrade Turians are still built on a human skeleton. Miriam in Shining Force Feather might be a living Lampshade Hanging. She meets our protagonists and is immediately amazed, as she hasn't ever seen a human before. Never mind that Miriam is an elf, and that the only difference between her and Jin are her pointy ears, slanted eyes, and skinnier build. One scene later, she meets Alfin and is equally wowed, as she's never seen a Core Unit before, despite that Core Units are... Ridiculously-Human Robots. Meanwhile, she meets all the varieties of Petting Zoo People with no more than chipper enthusiasm. In another animated example, the cast of Futurama is virtually all two-arms two-legs one-head humanoid (for most of the time). This is probably more to make it easier to animate jokes for them than anything else, as the show has otherwise shown a fair amount of ingenuity in depicting odd aliens (sentient nebulae, swarms of flies, etc). Subverted with Leela, who is revealed in an early season to be a human mutant who was raised to think she was a Last of Her Kind alien. Starfire of the Teen Titans has orange skin and Bizarre Alien Biology, but looks otherwise human enough to have a relationship with the resident Badass Normal. She also has superpowers, of course. This page was last edited on 20 September 2018, at 00:44.